Standing STEW BREW WITCH WITH VICTIM ANIMATED PROP is cooking up a sinister potion and the secret ingredient is a small child! 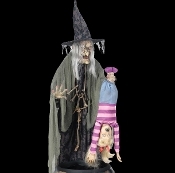 Menacing sorceress crone animatronics prop measures approx 80-inch (200cm) tall when fully assembled. INCLUDES A 400W *FOG MACHINE WITH HOSE ATTACHMENT for added terror factor (*fog liquid NOT included). Her outfit features black and gray fabric robe with spooky gauze and bone necklace detailing. Plug in the UL power adapter into any standard outlet and choose from Steady-On, Infra-Red Sensor or *Step-Here Pad (*YES, Included) activation options to operate. Once activated, fog will begin to swirl in the Stew Brew Witch’s cauldron while ‘’smoldering coals’’ flicker underneath. The witch’s eyes light-up while her head and torso turn from side-to-side. She proclaims one of three sayings while the poor victim screams and flails about. The Infra-Red sensor works up to 6.5 feet away and functions in all lighting conditions. This Halloween Animatronic also includes volume control to adjust the voice to your choosing. This menacing enchantress stands before her bubbling black cauldron with flickering "smoldering coals" while holding a small blond-haired toddler by the feet. Includes 400W Fog Machine and hose attachment for added spooky ambiance! Once activated, the fog will begin to swirl in her green bubbling cauldron as the witch's eyes light up, head and torso turn from side-to-side and the child screams and flails about! steady-on, Step-Here pad, and infra-red sensor (works up to 6.5 feet away and works in all lighting conditions). Includes a standard UL power adapter which plugs into any 110 outlet. Assembly required, easy to follow instructions are included. Animation right to left uses 36 inches of space. Assembled dimensions: 80-inch (200cm) H x 40-inch (100cm) W x 45-inch (112.5cm) D.